The rebirth and redefining of the Sixth Doctor has unquestionably been one of the distinct highlights of Big Finish’s Doctor Who audios, but the recent adventures featuring Colin Baker’s incarnation have lacked that something extra to really set them apart like so many of his earlier releases did. This trend continues in ‘Catch-1782,’ a story that takes a unique perspective but fails to fully explore or realize the full potential of its approach. The Doctor and Mel, answering an invitation from Mel’s uncle, arrive at a scientific foundation to join in its centennial celebrations with a time capsule ceremony. The building that the Foundation is situated in once belonged to Mel’s family, and she takes the opportunity to do some exploring into her own past, soon finding herself somehow transported into the past and interacting with her own ancestors. This premise holds great potential as the past can directly change the personal future, and a derivation of it has even been used in Big Finish’s own ‘The Marian Conspiracy.’ Rather than political intrigue, though, the past in ‘Catch-1782’ focuses mostly on Mel trying to integrate herself into her ancestor Henry Hallam’s home, the requisite drama of the grieving lord falling in love with Mel and spurning the love of the jealous housekeeper following in short order. The title, of course, borrows its name from Catch-22, and here Mel’s knowledge of the future seems to ensure that she will need to remain in the past in the life she’s begun living. This is a story that again goes against the typical formula of Doctor Who, offering no real villain or set action pieces, choosing instead to focus on its characters and their situations. However, the situations themselves are a bit suspect, especially since her uncle at the Foundation in 2003 casually regards her as if they have just seen each other despite Mel leaving with the Doctor in late 1980s. Obviously time travel allows for loopholes, but this disparity in timing- and even how the invitation came aboard the TARDIS- is never sufficiently addressed. Likewise, Mel’s self-proclaimed love for science is quickly forgotten as she bypasses the opportunity to discuss scientific aspects with other enthusiasts to research her family instead. Usually the stories that are lighter on plot allow a deeper insight into the main characters and give the supporting characters a chance to really shine. With this really being a story about Mel, this opportunity is missed since she spends the majority of the story dazed or drugged, the physicians of the time misdiagnosing her situation and putting her into a deeper torpor. It’s a convenient plot contrivance that Mel becomes slightly amnesiac, but it’s intriguing that the locals of the past would classify her as deranged since she has ideas and aspects that don’t fit in with that time’s standards. Ultimately, though, this plot thread is left rather unexplored, and the more traditional love story is told instead. The Doctor’s realization that Mel has become a part of history and that she must stay there to preserve her family’s future is very effective, but the empty resolution where it turns out that, in fact, no Catch-22 situation ever existed falls completely flat. Fortunately, the performances are solid throughout, even if Colin Baker is sidelined more than usual once again as the story once more focuses on the companion’s plight. Bonnie Langford benefits from this focus, and she does very well in portraying Mel’s reactions to yet another uncomfortable situation for the character. Given the relative basic manner in which the supporting cast of the past is scripted, Keith Drinkel does extremely well to make Henry Hallam interesting and engaging. However, Derek Benfield as Mel’s uncle John becomes the star of the episode as he fills the void that Mel’s absence has created, playing well against Baker. 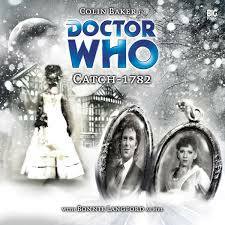 ‘Catch-1782’ is an enjoyable enough story, but there is certainly some padding in key areas to fill the four episodes allotted while some of the more intriguing aspects remain incompletely explored. The script is inherently interesting, but it doesn’t quite manage to fully overcome the gaps in logic and lack of characterization that could have made it something much greater.